The right to vote is considered a fundamental right within our democracy; however, for Native Americans, the fight to obtain voting rights is couched in a long history of racism and struggle. When the Fourteenth Amendment was passed in 1866, making all persons born in the United States citizens, Indians on reservations were specifically excluded. Michigan Senator Jacob Howard opined, “I am not yet prepared to pass a sweeping act of naturalization by which all the Indian savages, wild or tame, belonging to a tribal relation, are to become my fellow-citizens and go to the polls and vote with me…” (Congressional Globe. May 30, 1866). page 2895). There were pragmatic reasons, beyond racism, to keep Native Americans from voting; given their large numbers, votes by Native Americans at the time would have wielded significant political power. It was more than half a century later that the Indian Citizenship Act of 1924 ensured all Native Americans born within the United States citizenship. However, the Act did not automatically enforce the right to vote. While the Fifteenth Amendment declared that a citizen’s right to vote could not be denied on account of race, many states were able to find other reasons to deny Native peoples the vote—residing on a reservation, tribal enrollment, taxation, and incompetency were all used as reasons for denying Native citizens in some states the right to vote. One outcome being that, thousands of Native veterans, including American Indian Code Talkers returning from World War II, found themselves prohibited from participating in basic civil liberties in the nation that they fought to protect. The Voting Rights Act of 1965 finally outlawed exclusionary practices that “deny or abridge the right of any citizen of the United States to vote on account of race or color.” However, despite these protections and subsequent legislation, discriminatory practices continue to this day. 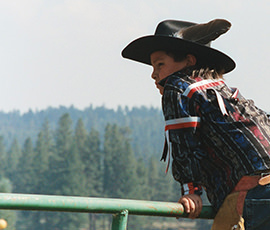 Since its inception in 1970, NARF has worked on cases to ensure equal and fair access to voting for Native citizens. Repeatedly we have encountered voting rights abuses against Native Americans in Alaska, South Dakota, Montana, Arizona, New Mexico, and other states with significant Native American populations. 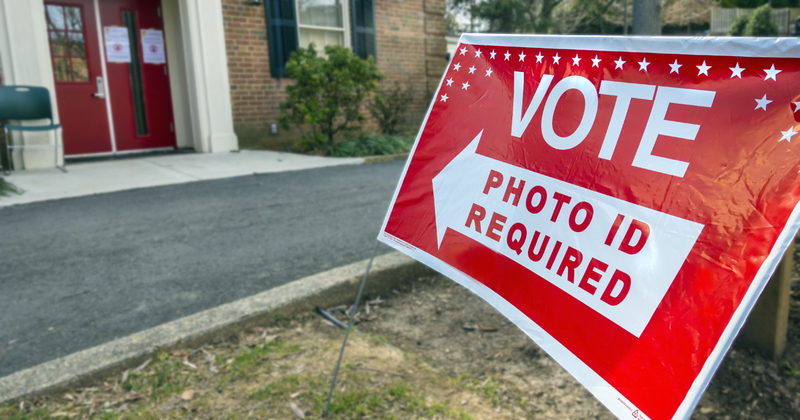 In addition, in the wake of the U.S. Supreme Court’s 2013 decision striking down parts of the Voting Rights Act, numerous state legislatures have passed new election laws that impose significant barriers to Native voters. In January 2015, NARF proposed an ambitious new project: gathering voting rights advocates, lawyers, civil rights experts, and tribal advocates into one room to discuss current problems with voting in Indian Country and begin to develop solutions to these problems. 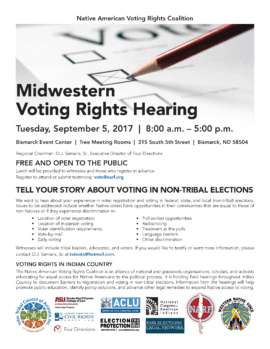 Previously, individuals and organizations working to protect Native voting rights did so independently, with no coordinated strategy in place. Often, the work was reactive—in response to an immediate threat—rather than proactive or planned in advance of an election. That is what NARF’s project was meant to change. Thus, the Native American Voting Rights Coalition (NAVRC) was formed. The NAVRC includes, among others: Native American Rights Fund (NARF); National Congress of American Indians (NCAI); American Civil Liberties Union, Voting Rights Project (ACLU); Lawyers Committee for Civil Rights (LCCR); Fair Elections Center; Western Native Voice; and Four Directions. NAVRC is organized into three working groups: legislation and policy issues (led by NCAI); litigation (led by NARF); and capacity building and education issues (led by LCCR). The project’s main goal is to remove barriers to Native American voter registration and voting, increase Native civic engagement, and foster a more informed and active Native electorate. With mounting evidence of voter suppression and violations of voting rights laws, NAVRC has accelerated its work. This work includes: (1) planning for redistricting related to the 2020 census; (2) addressing violations observed in the 2016 elections; and (3) overseeing the largest survey of Native voters ever conducted to discover the state of voting in Indian Country. Visit vote.narf.org to learn more about the Native American Voting Rights Coalition and its current activities.